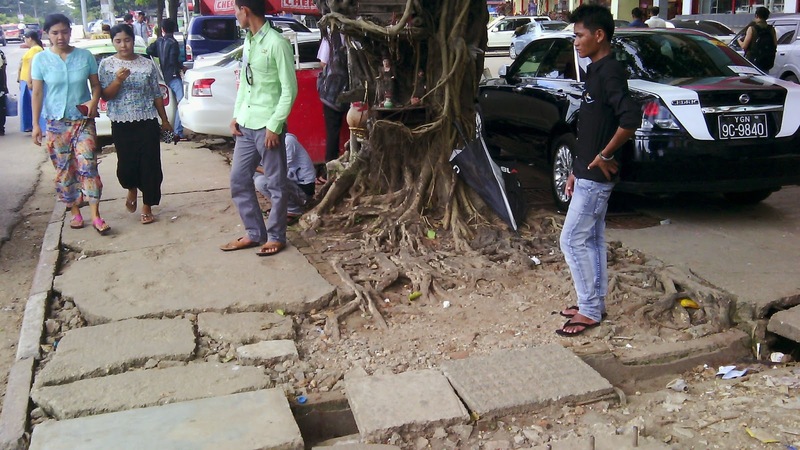 Like the sidewalks in Yangon, that do double duty as pedestrian pathway and sewer cover, a volunteer placement has its challenges. The sidewalks are often constructed with relatively high sidewalls covered by concrete tiles of four by two feet. There are often fairly significant gaps engineered in the sidewalk; I think, to accommodate high storm water flow rates during the rainy period. Most sidewalks are in various stages of disrepair. Missing covers are common, cracked ones ubiquitous. No idle ambling over these Yangon sidewalks. Vigilance is required, but in the end, they do function to keep pedestrians safely separate from the traffic. Similarly, a volunteer placement has its challenges, but, in the end, it generally serves its purpose of developing organizational, functional, or analytical capacity in our partner organizations.. Thanks for all of your posts - I have read them and appreciate the glimpses of this "other" existence. Have fun on your travels. Cheers!